Bioval BIO 4000 count of Biodegradable BBs. Sniper grade, but recommended for AEG usage too. Perfectly formed BBs - a perfect sphere with no air bubbles and are made of 100% natural ingredients. 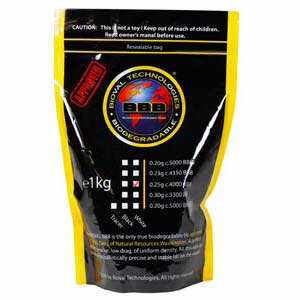 Earth friendly environmental airsoft ammo. We love the .30 weight, as they're super accurate and blow through brush well. The Bioval Bio BBB's Non-Marking Ammo is specifically designed for use by Military & Law Enforcement personnel during (FOF) Training. Our proprietary ingredients combined with our stringent quality control enable the production of the worlds most accurate Biodegradable Non-Marking Training Ammo. Shelf Life: There is no concern, just store the bb's in a cool, dry place. H20 alone will not start the degradation of the BBB Bio or BBBMAX Bio bb. The BBB Bio & BBBMAX Bio bbs' environmental degradation time is irectly related to numerous environmental factors.